The tussle is on between the first three candidates as Benedictine Geethika Jayatileka took over the lead from Sebastianite Anusha Perera in the Platinum Contest for schools playing in the division one in the SLSCA tournament at the end of the 6th week counting in the Sunday Observer/Mobitel Most Popular Schoolboy Cricketer of the Year Contest 2013. Voters dropped Anusha Perera (7,524) to number three position after being at the top last week while Geethika Jayatileka who was placed second took the first place polling 9,024 votes. There were no changes in the Gold segment for division two schools. 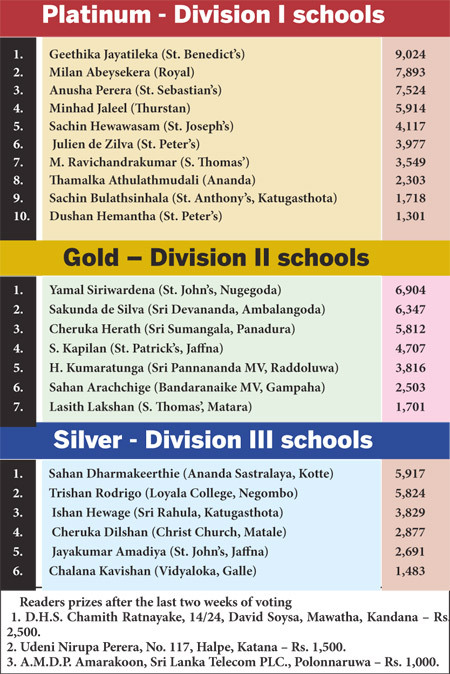 In the Silver for division three schools, Cheruka Dilshan of Christ Church College, Matale went one step ahead from 5th place to 4th polling 2,877 votes pushing St. John’s, Jaffna’s Jayakumara Amadiya (2,691) into 5th place. There were no changes in the Gold segment for division two schools. In the Silver for division three schools Cheruka Dilshan of Christ Church College Matale went one step ahead from 5th place to 4th polling 2,877 votes pushing St. John’s Jaffna’s Jayakumara Amadiya (2,691)into 5th place . Produced by Lake House Copyright © 2013 The Associated Newspapers of Ceylon Ltd.